What do Thomas Edison, Buddy Holly, and Eugene Lang have in common? Each of them propelled a home business into a hugely successful venture. Lang Exterior opened for business in 1953 in a garage on Chicago's southwest side with a single product: aluminum storm windows. 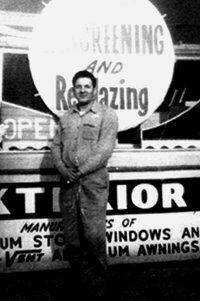 Eugene Lang was the founder, the manufacturer, the salesman and the installer. Lang built up the company and in 1968 acquired three 10-ton presses, two 5-ton presses, and all the dies necessary to expand into the prime replacement window market. Lang later developed a process to manufacture a wood-grain version of the solid white window-an idea he got from wood-grain shelf paper. He purchased a wrapping machine to affix the new finish to the vinyl profiles. But after 9 months of working until midnight 6 days a week, he told his son Darb, "It can't be done." The solution came to him the very next morning. That idea was the start of the Lang Exterior Top Coat® line of woodgrain finishes. Lang Exterior remains a family-owned and operated business but now is one of the major replacement window suppliers in the Midwest. Continuing a proud tradition that goes back 66 years, the company continues to grow and innovate. Today's line of Lang Exterior windows offers not only color and woodgrain selections unmatched in the vinyl industry, but also the latest vinyl construction techniques and the latest thermal efficiency window and patio door technologies.